I'm getting a completely black screen any time I log into my MacBook. I enter login details and hit enter. It was getting about half way through progress bar displayed after this and then screen just goes completely black. This all started when my laptop randomly went black while logged in the other day and browsing Facebook via Chrome. I tried hitting the reset password using Apple ID on login screen also but now I'm just getting the progress bar in boot up and it also goes to black screen after half way. Also tried holding the Shift key on boot to enter single user mode as per this quesion, it just quickly shows terminal options and then exits. Can’t remember the exact model of the MacBook but I think it’s 2012 retina MacBook Pro. Attached screenshot of trying to enter verbose mode with Cmd + v. It just quits this and goes to login screen after. Managed to log in after hours of numerous attempts. Crashed to blank screen again after playing videos in Chrome. Allowed battery to run out during day and started up again tonight, worked first time.....no crashes yet! Everything else just looks very Apple ordinary. I'm not a pro yet, but considering you were also using Google chrome, which uses "Hardware Acceleration", pushing your GPU, I am definitely thinking you may have a gpu that's starting to go bad or become defective. Then insert your bootable usb of mac OS and hold down the control key until you get to a boot screen. Select your usb key "install mac os high sierra" on the boot screen, and hit enter. See if it loads to the installation screen. If it does, try reinstalling to the same drive without re-partitioning or formatting your drive. As long as you dont format, none of your personal data will be lost. You will just be reinstalling the core OS. Once installed, boot back up and see if your screen is fixed. If not, then it most likely is a hardware problem and not a software problem. Could be a faulty graphics card or something. But try reinstalling mac os forst and let me know how that goes. So it’s getting repaired for free under ECLC even though 5 and a half years old!, happy days! Not the answer you're looking for? Browse other questions tagged macos macbook power-management . 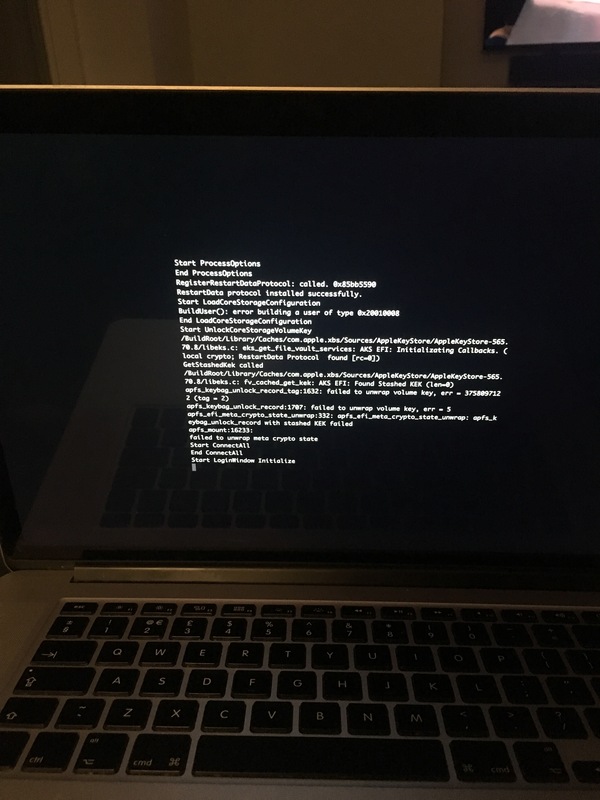 Does a black screen save battery on a macbook?